At the end of this month pupils at Wicor Primary School in Porchester will celebrate British Food Fortnight. On Wednesday 30th September usual lessons will be put on hold so pupils can get involved in the Wicor School Harfest Grounds Day. The event has been organised by the school in partnership with local food group, Hampshire Fare. 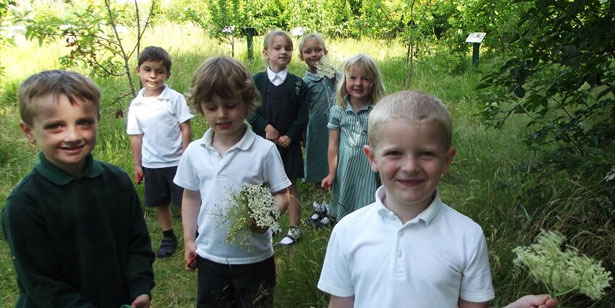 A wide range of activities will take place in the school’s grounds which include allotments, woodlands, wildflowers, herb and fruit plants and a tropics border. Our chef Liam Richardon from Rick Stein, Winchester along with front of house star Nathaniel Vowden will show three demos to year 5 and 6 pupils using vegetables harvested from the school grounds. Other activites the children will be involved in over the week will include harvesting vegetables from the school allotment, cooking vegetable tarts and geting closer to nature as they go outdoors exploring bee keeping and juicing in the orchard. The reception class will also be working with staff from Hampshire Fare to learn about different plants and vegetables through a Hog Hunt. To follow the progress of the project via Twitter follow @minihorts, @hampshirefare and @SteinWinchester for the latest news about the day.